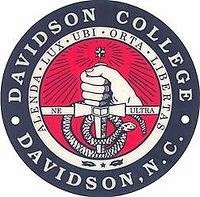 Davidson College is a private liberal arts college in Davidson, North Carolina. The school is committed to making every effort to operate sustainably and to educate students, faculty, and staff on the importance of sustainability. Their broad range of sustainability initiatives are focused on the triple bottom line. The school is actively seeking to reduce its footprint and offer a comprehensive environmental education including the Sustainability Scholars program. One of Davidson College's more interesting programs is titled "Sustainability Scholars." This initiative places students with community partners in the private, non-profit, and government sectors. The program addresses critical sustainability issues through real-world, immersive projects. The assumption behind this initiative is that sustainability has the power to transform our lives, our community, and the world starting today. Students involved with Sustainability Scholars integrate problem-solving skills through a wide range of community-based projects in a diverse range of environments from skyscrapers to community gardens. Students live cooperatively in the Eco-House, attend weekly reflection meetings, and participate in enrichment workshops lead by sustainability practitioners. The Davidson Sustainability Office works to develop and implement policies and programs that support the triple bottom line (ecological integrity, economic prosperity, and social equity). The triple bottom line approach is used to assist college offices, departments, and groups across campus in achieving their goals. The Sustainability Office strategically works to bridge efforts by students, faculty, staff, and the greater community, supporting collaborative and innovative approaches for exploring sustainability issues in course work, student-faculty research, campus life, community service, and internships. Davidson College is a signatory of the American College and University Presidents' Climate Commitment, which pledges to reduce the college's carbon footprint in specific, measurable ways set forth in a Climate Action Plan. To help reduce their footprint, the school has installed 378 solar photovoltaic panels and 64 solar thermal panels on the Baker Sports Complex. Davidson has also built a sustainable food system through Dining Services, the Davidson Farm, and Physical Plant's on-campus composting services. Davidson's Environmental Studies program offers both a major and a concentration. The major provides overview courses, breadth and depth components, and a capstone project in the senior year. The concentration provides a broad exposure to a range of environmental issues. Students can apply for an alumni-funded green grant, participate in the Sustainability Scholars program, design a study abroad research topic centered on sustainable issues, and collaborate with faculty on sustainable research projects. Student involvement inspires and informs sustainability initiatives, programs, and policies on campus. Student engagement is the strongest asset in positive change efforts at the college. Student organizations not only encourage collaboration on broad environmental and social justice issues, but they also host events and workshops, and foster sustainability on campus and in the greater community. Established student organizations focused on sustainability include the Environmental Action Coalition, Food Club, EcoTeam, and the Responsible Consumption Working Group. Internships & Work Study (two interns each semester focus on environmental justice in the Charlotte-Mecklenburg region). For more information about Davidson College's sustainability efforts click here.